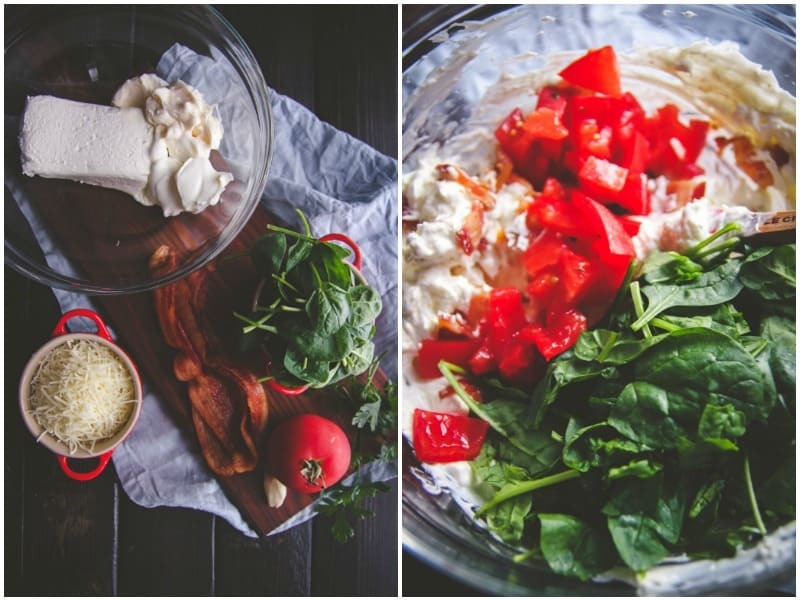 This hot cheesy BLT dip is my new all-time-favorite-party dip, it’s SO incredibly good. 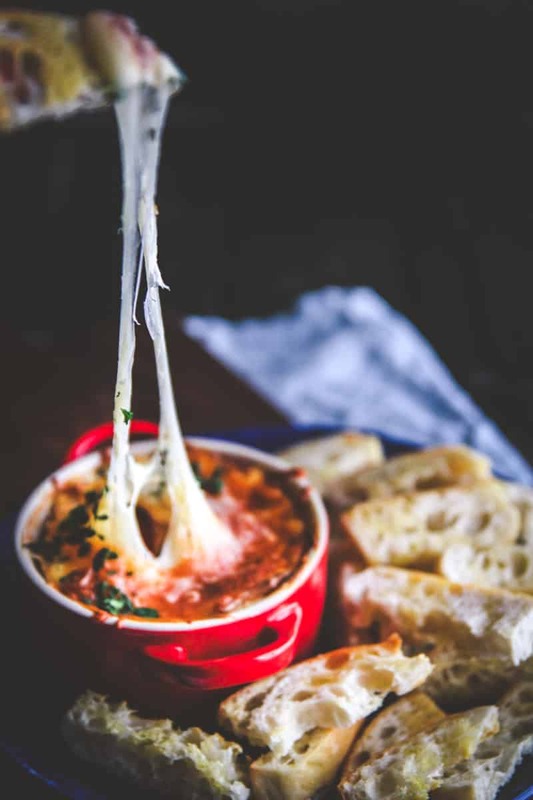 It’s hot, but not spicy hot, the kind of bubbly hot that has ooooey gooooey melty cheese for miles and will have all your guests begging asking for the recipe. 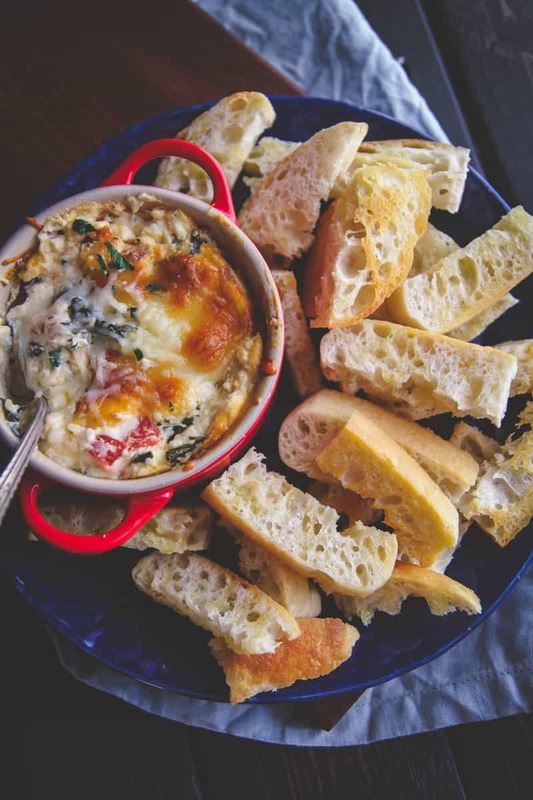 I wish I would have posted this dip a little sooner so that you could have made it for Labor day, but it will be perfect for whatever holiday or get together you have next, trust me, make this, wow your guests! Speaking of Labor day, how was your long weekend? The Labor day weekend is our wedding anniversary weekend so we always typically take a little trip – if you follow me on Snapchat (username: Sweetphi) you would have seen we took a road trip with our dog, traffic was horrible and we were in the car 11.5 hours one way, 9.5 on the way home. More on the trip later, but it was nice to leave my computer behind for a weekend…but I kept thinking about this dip and how I couldn’t wait to post it! So a few weeks ago my hubby and I went on a double date with two amazing friends to one of our favorite restaurants and we had the most glorious appetizer. The restaurant changes their menu daily (it’s a super small place – only 6 tables), and the appetizer for the evening was for a BLT dip. Our waitress said it had heirloom tomatoes, thick smokey bacon, spinach as the lettuce, and that it was cheesy…yes, we’ll have that, thanks. 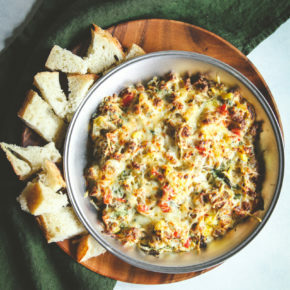 It came to the table and sure enough, it was cheesy, bacony, had little pieces of tomato and spinach throughout, it was SO GOOD. The dip came with fresh bread that had been warmed and brushed with olive oil. We all went gaga over the dip, and I could not stop thinking about when I got home, so of course I had to recreate it. As I gave it to my hubby to try, he said “babe, this is actually a little better than at the restaurant!” Whaaaattttt? How crazy cool is that? And I have to tell you, I hope this streak continues, because the food I’ve been cooking up in my little kitchen has been some of the best food I’ve ever made lately. It just keeps getting better and better. I keep making dishes that are based off inspiration from eating out – like these chickpea & zucchini veggie burgers (they’re legit the best veggie burgers out there) and these 5 ingredient shrimp and black bean enchiladas. Because we’re in the process of selling our house a lot of my bakeware is in storage, so I used mini casserole dishes I had on hand, but you could use an 8×8 square baking dish, ramekins, or one of those aluminum foil baking dishes so you can leave it at a party. 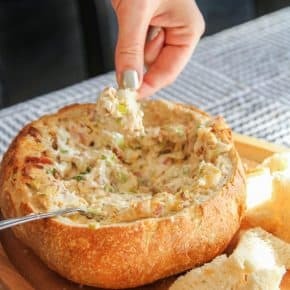 If there was a dip to win a dip award, this one would definitely be IT, the next gathering you go to, be sure to bring along this hot cheesy BLT dip. Start by cooking the bacon - I do this by baking it on a foil lined baking sheet at 350 degrees for 10 minutes, remove it from the oven, flip it, then cook for another 5-10 minutes depending on thickness. You want the bacon almost cooked through - a little softness is ok. Remove bacon from oven and transfer to a paper towel lined plate and blot grease off. Cut bacon in little pieces. 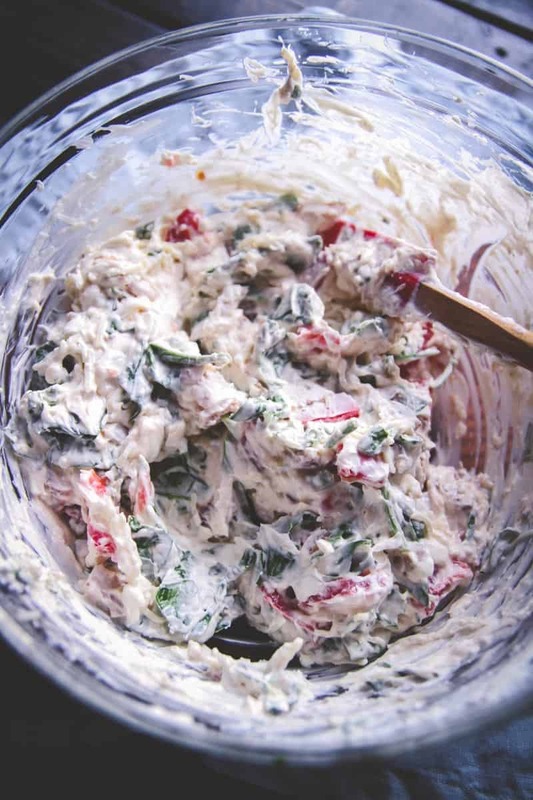 In a bowl combine cream cheese, mayonnaise, and sour cream, beat with a hand mixer (or stir it by hand) until combined. Add in bacon pieces, garlic, salt, cayeene pepper and stir, then add in baby spinach and tomato pieces and half of the cheese (3/4 cup). Stir until combined, then spoon into baking dish (or dishes). 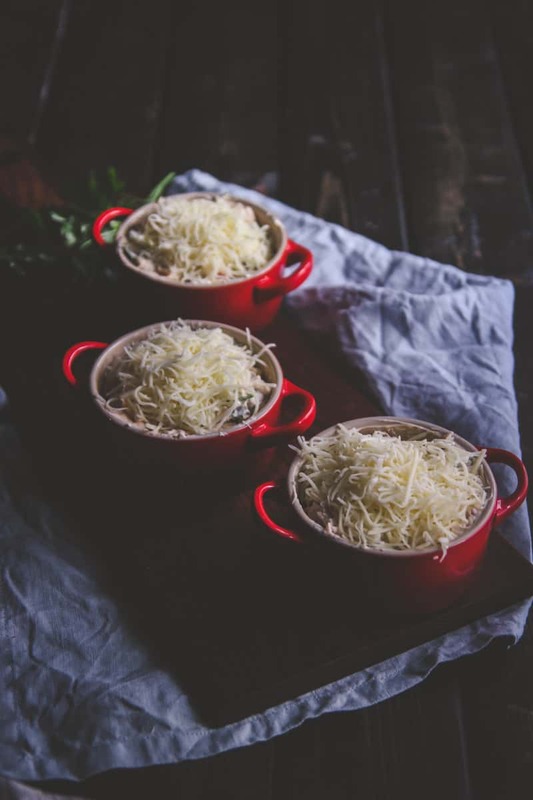 Sprinkle remaining cheese on top of the baking dish (or divide among the baking dishes) and bake for 15-20 minutes, or until the cheese on the top is melted and the edges start to brown. Remove from oven, allow to cool for 5 minutes, then serve and enjoy! With football season ahead, this looks like the most delicious, celebration worthy dip! Cheesy goodness makes me happy! hey girl this is right up my alley! Yummy! 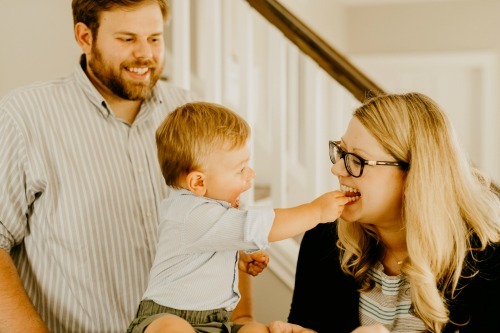 Thank you so much, so glad you like the looks of this dip – it truly is one of the best dips I’ve ever made, i’m totally going to be making this over and over for football season and the upcoming holidays! Happy Anniversary! Labor Day week end is our wedding anniversary week end too (55 years, this year). Looking forward to trying this dip out. This looks so creamy and delicious! Just in time for football season! Hey, we still have all of football season for this dip, right? It sounds so incredible! Oh my! This dip! Perfect game day food right here!! Ugh sorry about all that traffic – that’s the worst!! But hope you enjoyed the trip otherwise! 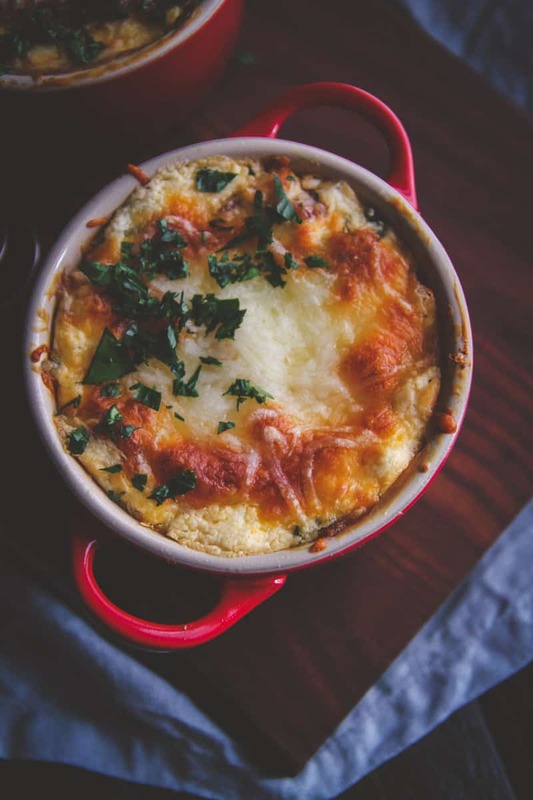 Thank you so much girl, and this dip…omg, i’m legit dreaming about it still!